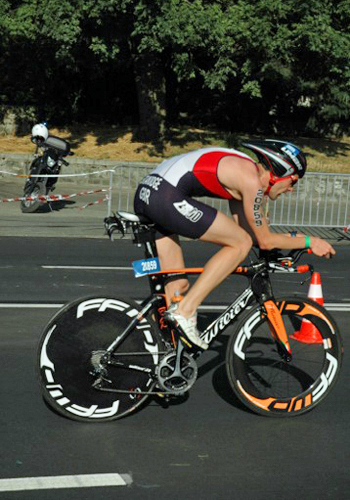 Next race after IM Staffs 70.3, was the European Olympic Distance Champs in Geneva. It gave me just over 2 weeks to build in some extra speed work into the plan, as up until this point, I’d been predominantly training for the Half Ironman. 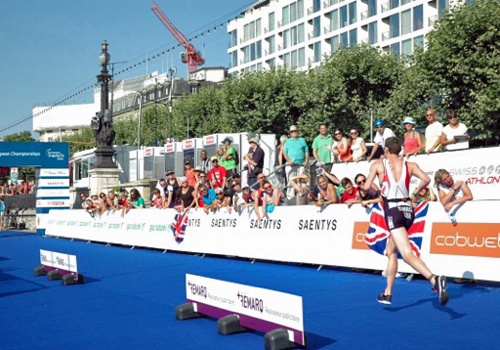 The European Champs have fond memories for me, as it’s where I started my International career, first of all as a Youth (14-16 age group) and then as a Junior (17-20) for Great Britain. It’s exactly 20 years since making my debut in Stockholm in 1995 and will be the 7th time I have raced these Championships. I came close to winning twice, once in 2007 in Copenhagen and again in 2009 in Holten, so gained silver medals each time. Therefore, this time, I was very much looking to see if I could go all the way and win the title. As race day approached, the weather forecasts were suggesting some pretty hot weather – with temperatures into the mid 30s. The usual panics on social media started to materialise with the wetsuit/non wetsuit swim debate, but as race day approached, the temperatures fell just short and it was declared the swim would be with a wetsuit. For some reason, the 35-39 Age Group was the very last wave of the day at 7.30am, meaning that we would spend most of the day catching the earlier waves and having to overtake. To be fair, it didn’t cause too many issues on the swim and bike, but the narrow and winding run course proved to be a bit more of a problem. 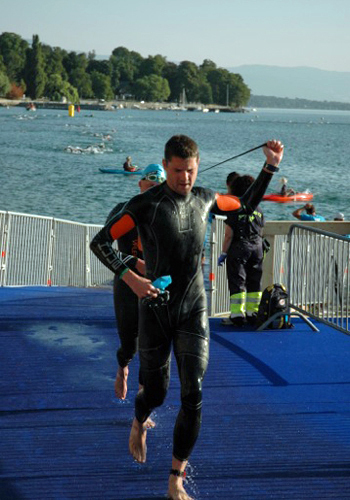 The swim in Lake Geneva went smoothly and I was out in 3rd place, with 2 other swimmers about 20 seconds ahead. The bike course was 2 laps in length ane was almost pan flat, apart from one hill (of approximately a km), which had a short steep section of maybe 10% (that was about 300m long in the middle), and then a quick descent back to the lakeside. I started off hard, to catch the 2 athletes in front, the first I caught within the first few km and passed easily, the 2nd (a French guy), took about 7 – 8km to catch. As he was riding so strongly, I put an effort in to try and open a gap straight away, but he was able to match it and just sat in. He then basically sat there for the next 30km to the end of the bike and never came through! On to the run, my ‘French friend’ started to fall back straight away, despite my feeling like I had not started that quickly, so I decided to relax into my stride for the 1st lap. By this time, it was hot and there were lots of people on the course. As there were a couple of places on the course where you could see the athletes behind, I made the most of taking a bit of a look round, to see if anyone was making any moves through the field. 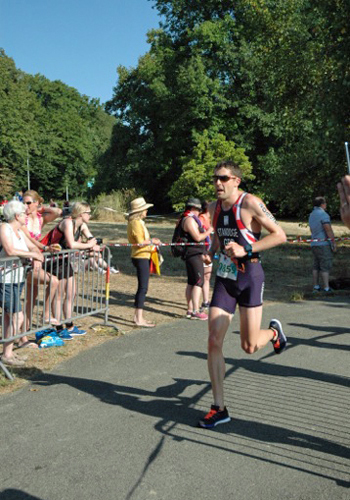 However, it seemed that the heat was stopping anyone from running that quickly, so I think my tactic of a hard swim and a hard bike had paid off and so I didn’t need to do anything stupid on the run. 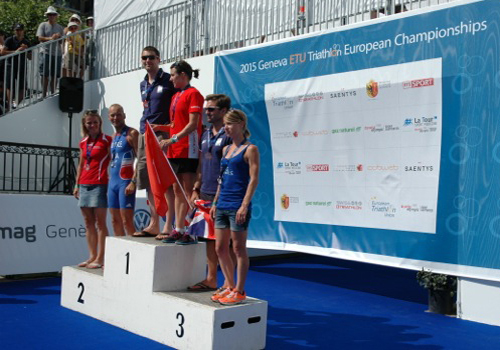 So 20 years on, I finally get my European Title!!!! Not much time to enjoy it though, as I will now get ready to move back to the Half Ironman distance for the Dublin 70.3 in 4 weeks and then the World 70.3 Champs 3 weeks later…..